We can arrange a full of half day tour of the Medina with an Official Guide. This allows you to explore the main sights and to get your bearings for when you venture out on your own. 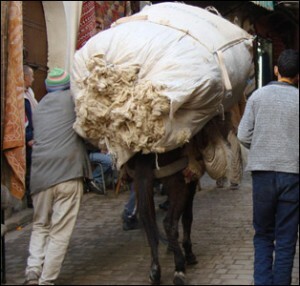 The ancient Medina of Fez is the largest pedestrianised area in the world. A warren of almost 10,000 streets pulsating with the energy of a working city which has hardly changed for centuries. It is home to 250,000 people, living, working, and learning within its ancient walls. No guidebook can prepare visitors for the sensory assault that awaits them. Sights, sounds, and smells will amaze and sometimes offend. Below you will find a list of the main sights but simply walking the streets and getting lost for an afternoon is the best way to experience the beguiling atmosphere. The tombs (on the hillside visible from DAR 47) provide excellent panoramic views over the medina and the wider city, as well as the surrounding olive tree lined hills. Easy uphill walk from Bab Guissa. A breathtaking 14th-century religious college. The best example of Islamic architecture a non-Muslim can see in Fez, with wooden walls elaborately carved with geometric patterns and Arabic calligraphy, and a beautiful minaret. 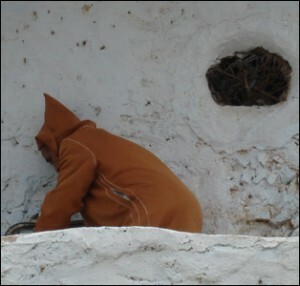 Part of the Bou Inania religious college on Tala’a Kbira. It has now been restored. 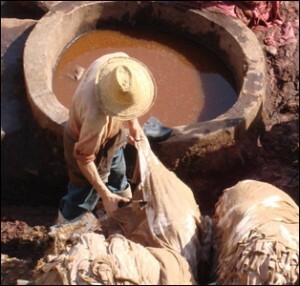 There are a number of tanneries in Fes where leather has been tanned in the traditional way for hundreds of years. The best way to see them is from the terraces at any of the leather shops adjoining the tannery. They will usually give you a sprig for mint as the smell can be overpowering. The easiest tannery to visit is the Chouwara Tannery located close to Seffarine Square – entrance to the leather shops is on Derb Chouwara. The Jewish Quarter in Fes since the Merenid period. The main street is especially interesting with its balconies and Art Deco zellij mosaic. Don’t miss the Ibn Danan Synagogue, a recently restored 17th century synagogue. This Hispano-Moorish palace houses a fine collection of traditional Fez crafts, the most admirable being the country’s famous cobalt blue pottery. 18th century caravanserai, beautifully restored, housing a fine collection of traditional woodworking. A large traditional riad converted into a museum of traditional crafts. Originally a psychiatric hospital in the 13th century, this recently-restored square is now a beautiful souk selling henna and pottery. 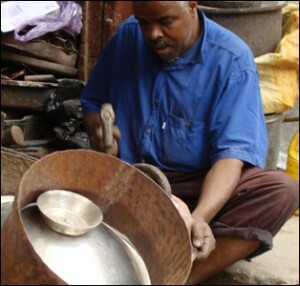 A picturesque square where copper and brass objects are made. Built in 1913, this blue and green zellij gate marks the entrance to the old medina. The original gate stands next to it. A grand 19th century house on Tala’a Sghira. Once the house of the minister of finance and defense, and later of General Lyautey, at the beginning of the Protectorate.